When I’m in Pittsburgh, I often get asked where Em-Media is based. When I tell them that our agency is located in Steubenville, Ohio, they often act surprised that we’re at a networking event in Pittsburgh. In the late 90s, I developed a campaign and corresponding jingle called ‘Burb of the ‘Burgh. The idea was to get across one simple idea. If you were interested in saving time instead of mileage, Steubenville, Ohio was a more than viable option--lower taxes, affordable housing, and good schools were just a few things that this Pittsburgh kid has found by moving, “ … two states over but right next door.” It’s less than a 40 minute drive from my office to some parts of Pittsburgh. Sometimes it takes that long to get from downtown to Murrysville. Lately, I’ve been thinking a lot about this same thing but from a different angle. I get it, some of you are never going to leave the city for my little piece of paradise. I think a lot of this has to do with Pittsburgh reinventing itself over the last decade and a half. It’s being heralded as the new Brooklyn. It consistently ranks as one of the best cities to live. And here I am with one burning question, When are we going to fix our outdated public transportation system? When are we going to bring the ‘burbs to the ‘Burgh? It’s time that Pittsburgh gets serious about expanding its public transportation offerings not only to lessen the traffic burden but also to stimulate an already steadily growing economy. I go to 50 Pirates games a year, and lately, I’ve been thinking how crazy it is that I can’t jump on a train in Robinson Township, where some of the best shopping in Pittsburgh is located, and ride that car all the way to the stadium. Imagine how much traffic that would alleviate as well as the psychological hurdle that people encounter when thinking about driving on the parkways. And while they may need tweaked, there are already some proposals out there, and besides some slight differences on how the rail lines would run, they basically look the same and do the same thing. 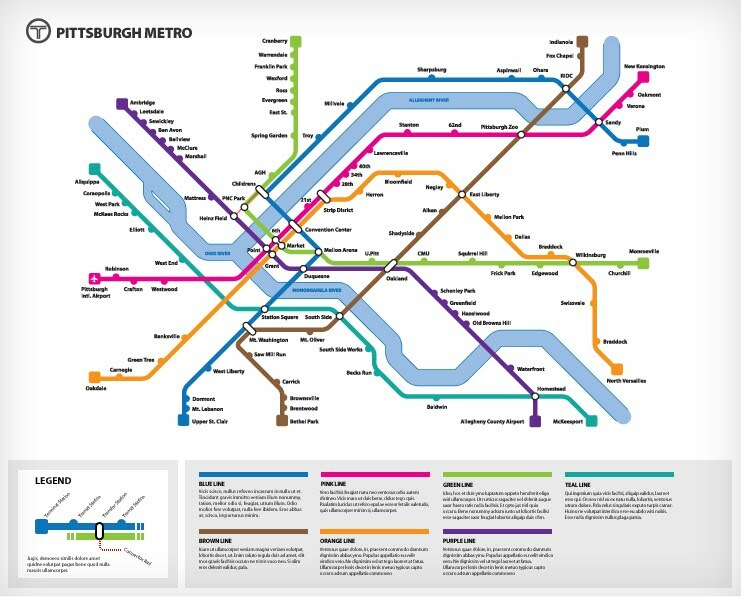 Two of my favorites are from Ben Samson and Extracogent's Pittsburgh Metro Map. Regardless of what map we come up with, we need to use the downtown station as the central hub and run lines out into the different suburbs of the city. Honestly, I have historically been against this expansion because I saw it as a waste of public monies, but I’ve come around. Pittsburgh is expansive. It’s known for its quaint boroughs that each bring their own personality and cultural offerings. Here are some statistics from the American Public Transportation Association that helped change my mind. Public transportation is a 61 billion dollar industry that employs over 400,000. Public transportation has been shown to increase the overall quality of life of residents by increasing access to health care, jobs, and education to all residents. For every $1 invested into public transportation, there are $4 in economic returns. Every 10 million in capital investment yields 30 million in business sales. A two-person household can save an average of just over $10,000 a year by downsizing to one vehicle. I'm beginning to think this is just the tip of the iceberg. Pittsburgh is my home, and even after all of these years, I am still overwhelmed each and every time I burst through the Fort Pitt Tunnels. Our city that sits majestically at the apex of three rivers is something cinematic and hollywood apparently agrees. However, it is notoriously hard to get around in. It’s time we solve this issue once and for all. It’s time we invest in the window of opportunity that we have by making it easier and more attractive for the best-of-the-best to bring their talents to the Steel City and to lessen the transportation burden for the over 300,000 residents already living here. There is no good reason that I should be able to drive to a Pittsburgh Pirates game in less time than someone in Cranberry Township. It’s time we bring the ‘burbs to the ‘Burgh and usher in the next stage of growth for our beloved city. Please share this. Let’s start a conversation. If anyone reads this, I’d love to talk to someone that is working on these issues. Em-Media has been involved in public transportation and economic development in the past, and we’d love to be a part of this project as well to help in any way we can.